Risotto is a traditional Italian dish made from Arborio rice, a specific type of short-grained rice. Usually, the rice is cooked slowly in broth with frequent stirring, and then mixed with cheese, cream, butter and vegetables, meat or seafood. Although risotto can be a main dish, it’s most often a side dish or a first course in a bigger Italian meal. 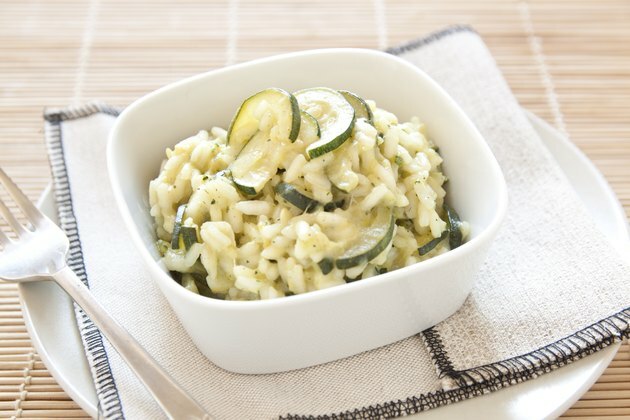 Risotto that has been prepared with broth and other ingredients has lots of simple carbohydrates but can also have a lot of saturated fat and sodium. A 3/4-cup serving of lobster risotto, for example, has 300 calories, 17 grams of fat, 9 grams of which are saturated, and 600 milligrams of sodium. That amount of saturated fat is 45 percent of a healthy adult’s recommended daily allowance, and the amount of sodium is 25 percent of the RDA. Regularly exceeding RDAs for sodium and saturated fat can increase your risk of high blood pressure, high cholesterol, heart disease and stroke, according to the American Heart Association. A moderately sized serving of risotto does provide plenty of valuable nutrients, especially if it includes veggies or seafood. The 12 grams of protein in a serving of lobster risotto, for example, is 25 percent of the RDA. The simple carbs in refined Arborio rice do have fewer vitamins and minerals than whole grains, but they provide quick energy for the body when converted into glucose. Plus, seafood risotto has healthy omega-3 fatty acids, which can reduce inflammation and improve cardiovascular health. If the risotto you eat typically contains a lot of refined grains, cream, cheese, butter and other ingredients with minimal nutrition, there are ways to make it healthier. For example, you can boost the fiber content but keep the creamy texture of traditional risotto by using a smaller amount of cooked Arborio rice and mixing it with cooked, short-grain brown rice, wild rice or another prepared whole grain. Add vitamins and minerals by mixing in more veggies, and use light cream or reduced-fat cheese instead of full-fat versions. Finally, keep your portion sizes in check and serve the risotto with a large green salad to help you fill up on fewer calories. Whole Grains Council: Whole Grain Risotto? How Much Sodium Is in Rice? How Many Calories Are in Macaroni & Cheese?